In March 2018 Microsoft released a fix that addresses a CredSSP, “Remote Code Execution” vulnerability (CVE-2018-0886) that could impact RDP connections. If the host you are working on has this fix, and the server you are connecting to does not have this fix (can occur when deploying new VM’s remotely) the error shown above pops-up. The best solution is to update the host you’re connecting to, but if it’s not possible to get access to the console for whatever reason, you can also lower the security on your own host (ouch!). I strongly recommend raising security again when you have updated the remote server. Today a customer ran into an interesting issue. 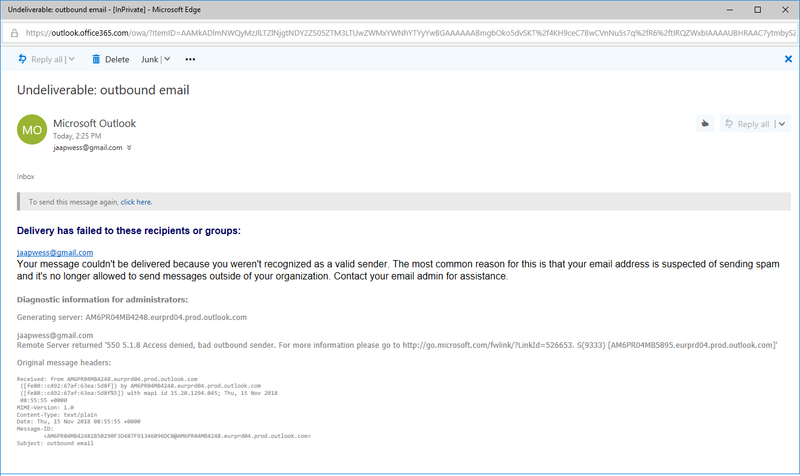 A user was not able to send out email to external recipients (this was already the case for a couple of weeks) but internal email, both in Office 365 as well as hybrid Exchange 2010 did work fine. Your message couldn’t be delivered because you weren’t recognized as a valid sender. The most common reason for this is that your email address is suspected of sending spam and it’s no longer allowed to send messages outside of your organization. Contact your email admin for assistance. At first, the only I read was “Your message couldn’t be delivered because you weren’t recognized as a valid sender” so it took me some time to figure out what was wrong. It’s not a permission issue (was my first thought) but Exchange Online Protection is blocking the account because of spam. Even in a hybrid scenario with centralized mail transport this can happen, because Exchange Online outbound mail (to Exchange 2010 on-premises) is still handled by Exchange Online Protection. So, it was already blocked for 9 days and 122 outbound spam messages were detected the last 24 hours. I asked the local IT guys to go to this specific workstation, perform an ant-virus run to clean-up the workstation so I can unlock the account. Update. 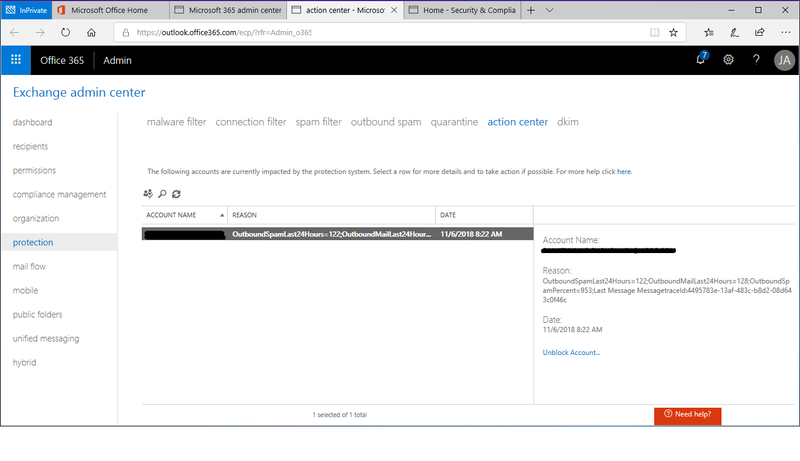 Some items from the protection and/or compliance center are moving to the Security & Compliance Admin Center (https://protection.microsoft.com). You can find the restricted users (i.e. users that are blocked from sending outbound email) under Threat Mangement | Review and Restricted Users. When installing a new Exchange server (2013/2016/2019) in an existing environment, Microsoft recommends installing this new Exchange server in a separate Active Directory site, configure the server there and then move the server to its production Active Directory site. To avoid this, the SCP should be configured as soon as it is created in Active Directory (and this is during setup itself). Tony Murray, also an MVP, has written a PowerShell script (Set-AutodiscoverSCPValue.ps1) that will check the existence of the Exchange server object in Active Directory, and when it is created by the Exchange setup application, it immediately sets the correct Autodiscover value in its SCP. From this moment on Outlook client can safely discover this SCP record, and it will be automatically connected to the correct Autodiscover URL and therefore the SSL Certificate warning will not appear (assuming the original servers are configured correctly of course).